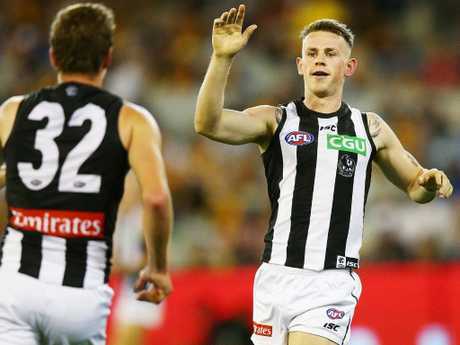 COLLINGWOOD youngster Ben Crocker has opened up on the difficulties of his father Paul's early onset Alzheimer's disease. Crocker's father was in his 50s when diagnosed with the chronic degenerative brain disease five years ago. Early onset Alzheimer's is a rarer version of the condition, causing many cases of dementia. Crocker initially held back on discussing his father's condition with the Magpies, but last year after speaking with the club's psychologist he decided to reveal it to the playing group as part of Crocker's own attempt to deal with the circumstances. Speaking with Fox Footy's On the Mark, he explained his father's condition started with memory loss, like forgetting to pick him up from footy training in Year 12, but only increased from there. "It is sad when I think about it that his involvement now (in my career) is pretty much nothing. He comes to the games but he doesn't understand what's going on," Crocker said. "I can't see feedback off him, I can't talk to him about how I played and how he enjoyed the game. The more I think about it, it is a shame that he doesn't know I'm playing for Collingwood, because I grew up barracking for Collingwood and I know how proud he'd be of me. "That's the saddest thing about it - that Dad would be so proud of me. He actually came into the rooms after my first game and that was probably the last memory he would've had of me playing footy. "He loves Eddie McGuire, because he watches Who Wants to be a Millionaire so he loves Eddie, so whenever he comes on he knows it's Eddie, and he loves Bucks (Collingwood coach Nathan Buckley). "But it is sad when I think about that he doesn't really know what's going on and I can't talk to him really about anything, so that's hard to deal with." Crocker and his family all help care for Paul. The Magpie understandably finds it difficult. "I'm not going to lie, it's really tough, and I don't enjoy it at all. It is really hard and you've got to build strength around it," he said. "There's times when he gets really agitated and I might be coming off an eight-hour day at the club and I'm absolutely knackered, and I fall asleep on the couch and I don't watch him for 10 minutes and something can go wrong. "He obviously needs help going to the toilet and stuff like that so I've had a few instances where I've fallen asleep and he's accidentally gone to the toilet in the living room or something like that. "Those are probably the moments for me where I sit back and go, wow, I can't believe this has happened. "You tend to get a bit upset but you've just got to find a way to deal with it - you can't be a sook about it, constantly thinking about the negatives isn't going to get you very far." 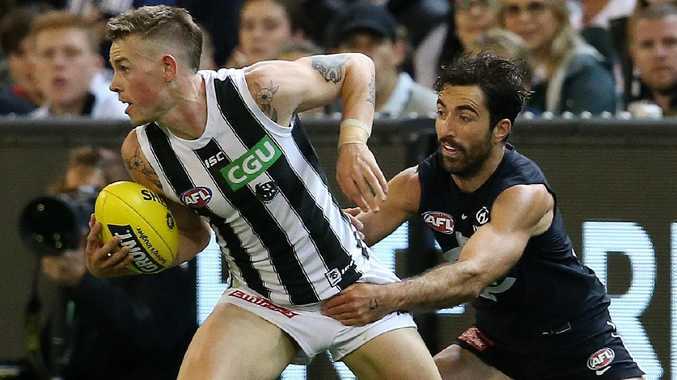 As Crocker's father battles the condition, he has had psychotic episodes, which Crocker has had to deal with while also embarking on his AFL career. "He has episodes where he doesn't know who his own reflection is, so he shouts in the mirror and gets pretty violent," Crocker said. "That's something I've never grown up around, he's never been violent. The other day was the first time he didn't know who I was or thought I'd done something to him, so he was quite violent towards me. "He's starting to swear a bit now, which sometimes is funny but when he's coming at you and swearing at you and trying to punch you and stuff, it's something that's not natural. I don't think any kid would want that happening to him." Early on, Crocker did not know how to deal with his father's condition. He says he is "ashamed" of how he handled it. "I used to treat him so badly because I thought he was just not quite himself, or maybe just acting a little dumb. That was probably the shakiest bit of our relationship," he said. "I was so angry all the time and that affected how I hung out with my friends, how I approached school, the way I talked to Mum as well. 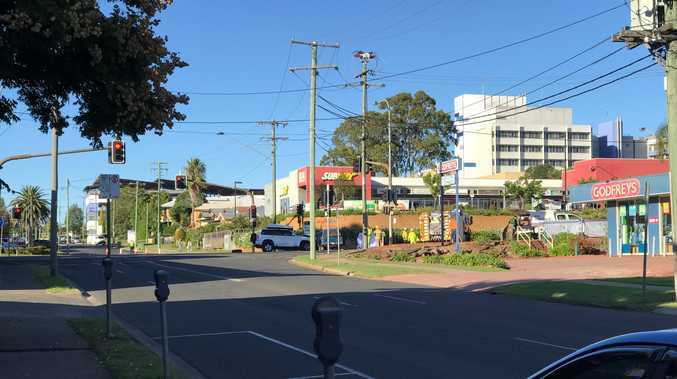 "Looking back on it, it is something I'm a bit ashamed of. If I could give advice to anyone going through the same thing as what I am is just to be open about things and don't make it about you. I definitely made it about me and how I was feeling." Crocker bravely explained to On the Mark how, eventually, this illness would take his father's life. "Mum's been told that this will eventually kill Dad. He will die from this illness," he said. "They have said the time frame with people who develop early onset Alzheimer's is usually about eight to 10 years. He's had it for five now. "I honestly don't think about it too much, but I'd be lying if I said that when people ask about Dad that doesn't come to my mind, because it does. "And I think the older I get the harder it gets to realise that when I have children and get married, Dad's probably not going to be around. "It's sad to know that my kids and wife isn't going to meet my dad, because he is such a good person and he's been massive in my life. It'd just be telling stories about him. And then you think about Mum, it's obviously hardest for her, the person that she's married and loved isn't going to be around. "You tend not to talk about is much but there are times ads come on about life insurance and stuff like that, and you kinda sit there in the room and no one says anything, but you know you're thinking the same thing." Registrations are now open for Dementia Australia's Memory Walk & Jog. Sign up and help fundraise here. If you need help or information, call the National Dementia Helpline on 1800 100 500.